Michael Brown was born July 19, 1963 in Newark. Big and quick, he was drawn to martial arts and basketball. His visions of being the next Bruce Lee dissipated as his height soared. He was already over 6 feet when he enrolled at Clifford J. Scott High in East Orange and was 6’9” by the time he graduated as the leader of the Tartans hoops squad. Mike played center and power forward for George Washington University. The D.C. press dubbed him The New Washington Monument after he appeared on the cover of the school’s media guide next to the original. Mike was one of the few college centers who could hold his own against Patrick Ewing, who played down the street at Georgetown. Mike led the Atlantic 10 in rebounding four straight years and graduated in 1985 as GW’s second all-time scorer and rebounder. He was either First- or Second-Team All-Conference in each of his four varsity seasons; his best season was his junior year, when he averaged 19.6 points and 12.1 rebounds a game. Mike completed his criminal justice degree in under four years. While Ewing went first overall in the 1985 Draft, Mike didn’t hear his name called until the third round, by the Chicago Bulls. He spent a year playing in Italy before coming to camp with the Bulls. He made the club as a low-post reserve and got to play with young Michael Jordan and, later Scottie Pippen. In the spring of 1988, Mike was selected by the Charlotte Hornets in the expansion draft and immediately traded to the Jazz straight-up for fellow New Jerseyan Kelly Tripucka. In Utah, Mike acquired a new nickname, the Brown Bear. He had the good fortune to play with another dynamic duo, John Stockton and Karl Malone. 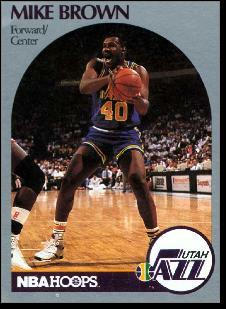 After five seasons with the Jazz, he played briefly for the Timberwolves, 76ers and Suns. Mike was known for his work ethic and team spirit. From 1989–90 through 1993–94, he did not miss a game. After his NBA days, Mike played in Greece and Spain before retiring in 2001. That year he was inducted into the GW Athletic Hall of Fame. He then coached in the minor-league ABA and the NBA Development League. In 2007–08, he was back in Chicago as an assistant with the Bulls. He also did some work for the National Basketball Retired Players Association. In 2014, Mike was head coach of the Fayetteville Patriots of the NBA D-League.